Bella Italia in Stratford upon Avon boasts an enviable location, close to the famous Anne Hathaway's cottage and just down the road from Harvard House. Perfect for a pre-theatre dinner or a break from taking in all of the wonderful sights of the birthplace of William Shakespeare, Bella Italia is a popular restaurant choice. Enjoy tasty dishes such as the Polpette Americano (beef and pork meatballs with garlic and herbs in a rich tomato sauce on a bed of spaghetti) or Salmone al Pomodoro (chargrilled salmon with green beans, roasted new potatoes and tomato and olive salsa). The set menu is great value and children aren't forgotten either with a well though out set menu for them too. Open from breakfast through to dinner, Bella Italia is a great addition to the restaurant scene in Stratford upon Avon. Save up to 40% on cinema tickets, 57% on family days out and enjoy kids eat free discounts. 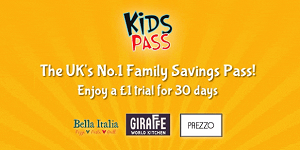 Offers valid for KidZania, Go Ape!, Digger Land, Blackpool Pleasure Beach, Lightwater Valley and many more. Looking for events in Stratford-upon-Avon?